If you find an error please contact me. 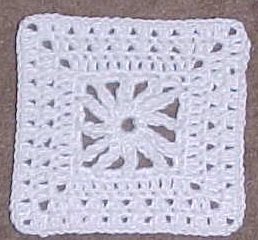 Thank you Barbara Schnepf for inquiring about this pattern! have now realized that some of the pattern language was unclear. NOTE: This pattern is worked in rounds without turning the work. RND 4: Sl st in next dc and in next ch 2 sp. Ch 3, (dc, ch 2, 2 dc) in same ch 2 sp. [* Sk next dc, dc in next dc. Back up & dc in the dc just skipped. (cross stitch made). Repeat from * 5 more times using only the unworked stitches (6 cross stitches in all on one side). Repeat from [ to ] twice. Join with sl st in top of beg ch. 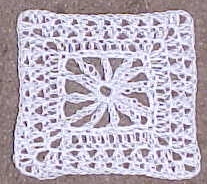 RND 5: Repeat RND 4 except you should work 8 cross stitches on each side instead of 6. Join with sl st in top of 1st dc.